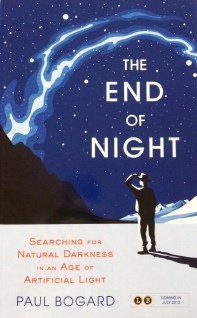 The End of Night: Searching for Natural Darkness in an Age of Artificial Light by Paul Bogard is an attempt to show readers why darkness is important, how it's being lost, and where to find it. Amateur astronomer John Bortle created a scale to rate levels of darkness, with 9 being the brightest (Las Vegas) to 1 being the darkest (some national parks). Bogard uses the Bortle scale to frame his book, with his chapters running backward from 9 to 1 as he seeks out sky that exemplifies each category and teaches us about light pollution in the process. Starting in Las Vegas, we learn that the brilliant ray that shoots out of the Luxor casino is the brightest beam of light in the world in the brightest city on Earth. Certainly this is not a place where people would or do go to seek out dark night skies, and children who grow up in this environment are unfamiliar with the dark starry nights that were ubiquitous up until the past century. But it's more than just a loss of stargazing here. Artificial light affects wildlife in detrimental ways, as illustrated by Luxor�s beam. Bats and birds leave their natural habitat to come feast on the bugs that flock to the light and then expend so much energy returning to their homes that they have nothing left to feed their young. A common stumbling block to getting people to embrace stricter light pollution controls is the belief that light equals safety while dark equals danger. This ingrained fear of the dark is in large part why streets, businesses, and even homes are lit all night long. Often this lighting shines into people�s eyes making it harder for them to actually see their surroundings clearly or get a normal night's sleep. Bogard uses an example of how schools in Loveland, Colorado, changed their lighting from all-night lights to motion detected lights. Not only did they save money and energy, but the police and community knew that if there were no lights on at the property that no one was present. The absence of constant lighting actually made the area safer from vandals or others who might be on the property. Night is important not just to the health of wildlife but to humans as well. In a chapter titled Body, Sleep, and Dreams, Bogard looks at night shift workers and the higher incidents of health-related problems they suffer such as obesity, diabetes, depression, cancer, and so on. Humans have a �circadian trough� that has evolved over thousands of years giving us our least energy and alertness from about midnight to 6:00 a.m. Disrupting the historical cycle of sleep for a sustained period of time is so serious that the World Health Organization has put shift work as a Type One risk for cancer. One of the impressions that should leave a lasting effect on the reader is that not only is light pollution damaging on its own, but it can also be seen as a canary in a coal mine. As Pierre Brunet argues, the presence of an astronomer is the sign of a healthy ecosystem. When the sky becomes too bright for astronomy and the astronomers leave, the sky has become light polluted and whatever has polluted that sky will eventually pollute other resources, given time. In the meantime, we are all encouraged to seek out the dark places to remember why they are worth fighting for and to make our own little corner of the world a bit darker for future generations.